Women from the Khorezm region of Uzbekistan who married citizens of Turkmenistan after 1992 are sent back to their native country with the stamp "Deported" in their passports. Unofficial estimates indicate that nearly 50 young women, many of them with children, have been deported so far. Zijeda Ruzimova was born in the Koshkupyr district of the Khorezm region of Uzbekistan near the Uzbek-Turkmen border in 1977. She married a Turkmen and moved in with him in 1994. Numerous appeals to state structures failed to obtain Ruzimova Turkmen citizenship. The marriage was not even registered in Turkmenistan. It follows that the young woman could not find a job. The family was sustained by the husband, a shepherd. What pittance Ruzimova earned as a small-time vendor every now and then came in handy too. Neither the children (Gulnara, Avazbek, Gulshod, Haji) were issued birth certificates in Turkmenistan. No birth certificates - no family allowances. Gulnara would have been studying in the seventh grade and Avazbek would have been a first-grader now but Turkmen schools are denied them. They do not go to school. Ruzimova and her children were imprisoned for three days in February 2006. 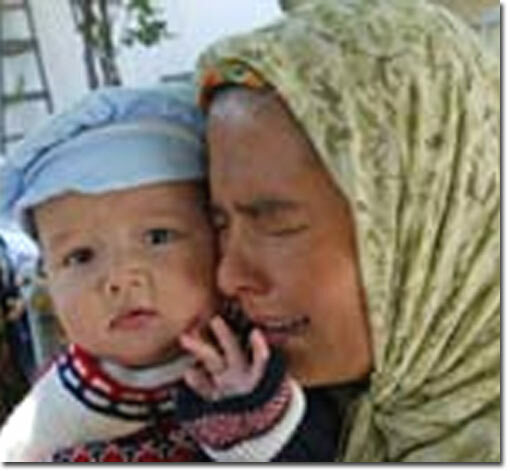 Once the young woman and her children were released, the Turkmen authorities deported them from the country. "My husband tried to get me Turkmen citizenship again and again but to no avail. We were invariably told that whoever had come to Turkmenistan when it was already a sovereign state would be deported sooner or later," Ruzimova said. "I insisted, and the authorities put my children and me in the guardhouse in the garrison nearby. Soldiers there answered by pleas and gave us some bread which I divided among the children. Meals consisted of skilly with some bran and mangel thrown in. The children had some sort of mattresses to sleep on and I slept on the concrete floor." Tashauz municipal authorities told Ruzimova to get out of the country fast - and take the children along. The husband pleaded with the authorities to leave him two children but it was a waste of time. Saying good-bye, the husband told Ruzimova that he would come for her and the children if the USSR were restored again. "I do not have the money the customs will want for documents for you," he said. "We were shoved in a car, driven to the Shavat Customs Office, and left there," Ruzimova said. "It was some Uzbek policemen who took us in and paid the taxi who took us to my parents'." Ruzimova does not intend to go back to Turkmenistan. Her children go to school in Uzbekistan. The family is getting allowances for them. Ruzimova's mother Oisha Hujanijazova said, "Nobody in Turkmenistan took pity on my daughter and her children. They were abandoned right on the border. Allah be praised, our policemen helped her with money so that she could come home. It was February when she turned up at our door in a summer dress with children in tow. In Turkmenistan, they abused her merely because she is an Uzbek." Mahmud Tangriberganov, chairman of the village people's council in Gozovot (Koshkupyr district), says that this was not an isolated or unprecedented episode. Durdipossha Polvonova of the same village was deported from Turkmenistan with her children in 2006. Five young women were deported to Gozovot. According to Tangriberganov, there have always been marriages between residents of what are now border areas of the two sovereign countries. Nobody has ever cared about citizenship. The locals even used one and same cemetery (Ismamut-ota) which is now on the territory of Turkmenistan. Before 2002 when the Turkmen authorities stiffened the border regime, Turkmens and Uzbeks visited the other country regularly. At least once a year Gozovot villagers went to the cemetery to revere their ancestors' memory. All of that is history now. Attendance of weddings and funerals, visits to the cemetery, even trips to the relatives across the border are now stiffly regulated. When tariffs were set on the crossing of the border (about $9), trips across the border all but ceased altogether. "There was even a bazaar here once, Dustlik-Gozovot. Turkmen vendors came here and never knew a problem," Tangriberganov said. "Problems began in 2002. Turkmen border guards began stealing cattle from us. All of that ended when the border was established and barbed wire strung." Uzbek policeman Ravshan Zaripov denies any friction between Turkmens and Uzbeks in everyday life. "Turkmens have always traded with us and married our women," Zaripov said. "These contacts will continue of course. Still, we respect our laws and they respect theirs. It's necessary to do whatever is needed to maintain the law and retain our friendship at the same time." Tangriberganov is convinced that the authorities of Turkmenistan could and should have registered mixed marriages and done whatever was needed to legalize presence of the Uzbeks on the territory of their country. It should have been done at least for the families that find themselves divided now.